Such a vibrant and pretty dress! Wonderful floral print! You look absolutely stunning from head to toe. Such a sweet look! I love the colors on that dress. Too cute! Love the dress, and particularly THE SHOES! love the dress and jacket combo! Beautiful dress, love that jacket too! Love the print and beautiful colors. You are so cute and ladylike! Love seeing how you style things. That dress looks so great paired with the army jacket! Love it! I love the floral dress paired with the army jacket!! I love how this jacket really makes the dress more casual! Super cute! Such a cute summer dress! Love those mules too! 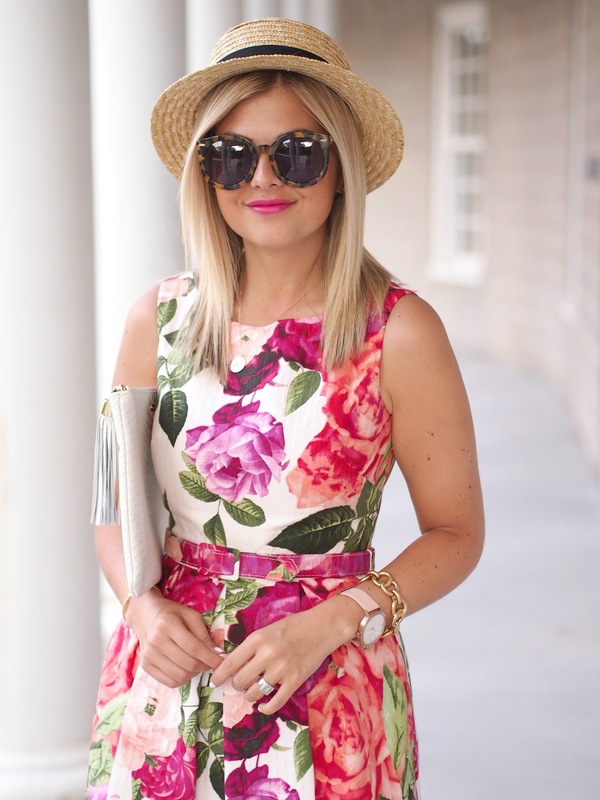 The dress & the hat make such a perfect combo! So stunning! Love the pink, vibrant colours! Very cute and I love the casual vibe that the jacket and hat bring to this look.